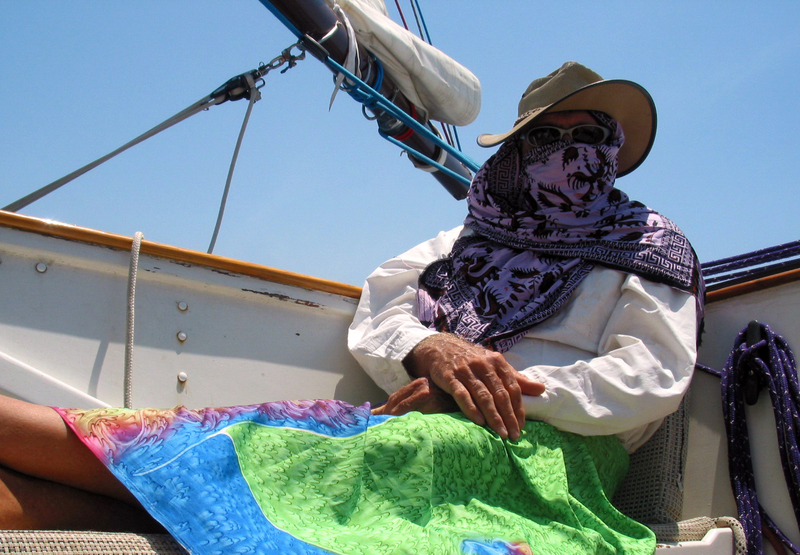 The tropical sun and heat were intense as we sailed north away from Bali and towards the equator. Both of us used our sarongs, ikats, and hats to the fullest. Indonesia offered a terrific variety of the most fantastic boats everywhere we went. This one was sailing into the small island of Bawean as we arrived there. 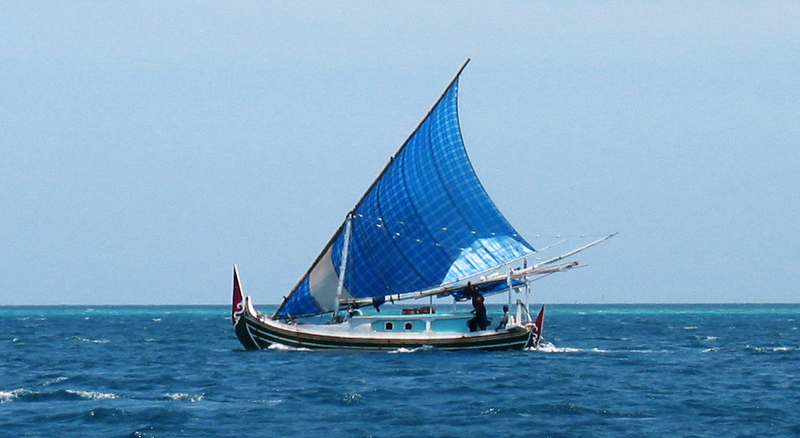 the ubiquitous Indonesian lateen sailing rig with polypropylene sails. 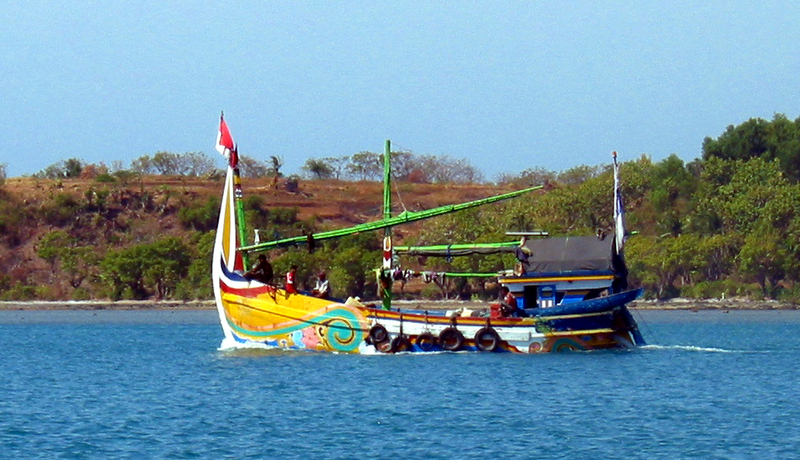 Bawean offered a terrific harbor near its northwest corner with an excellent anchorage. 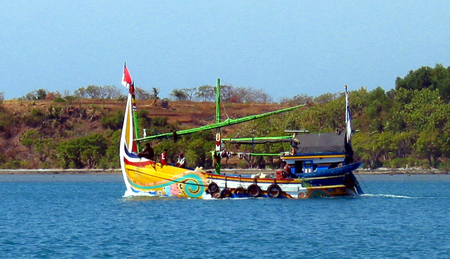 There were a bunch of these fishing boats from Java there. Fantastic lines! And fantastic paint jobs. 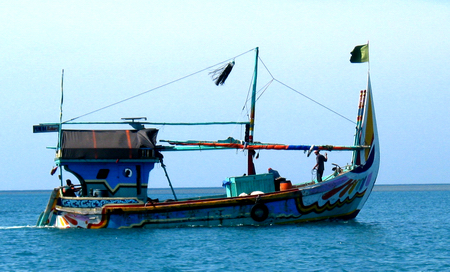 These fishermen know how to make a boat look good! Not only were these boats wonderful to look at. They were also full of good fish! And since they had lots of fish, Chrissi paddled over to get some. some lovely fish for free. 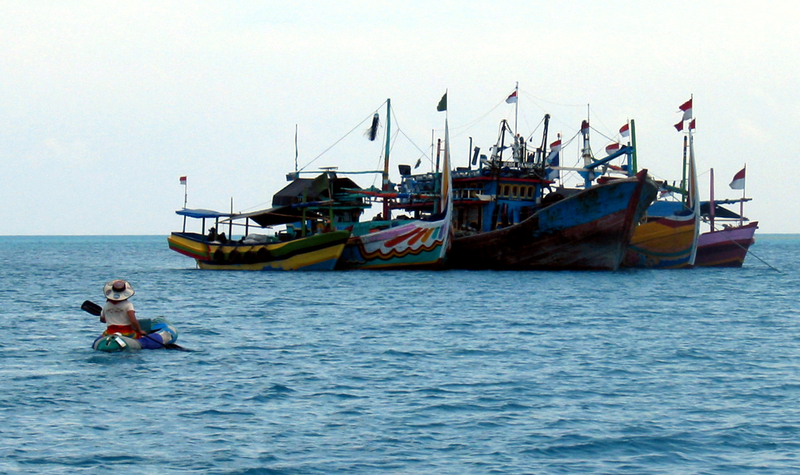 Bawean also had some pretty good markets in a fair sized town a few kilometers from the anchorage. Just hire some guys with motorbikes to take you there and back. 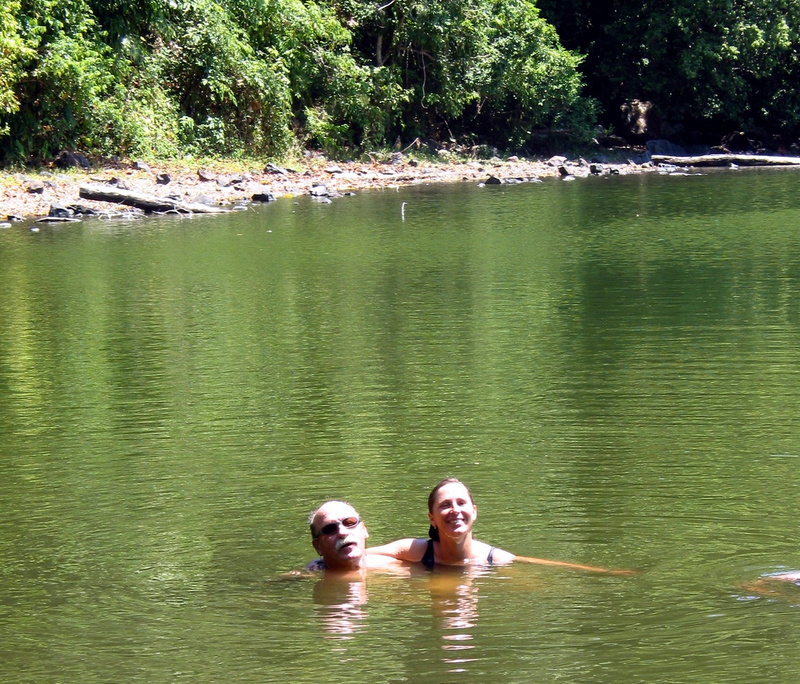 There was also a lovely lake high in the interior of the island, a very nice break from our life on the sea. Ahhh. 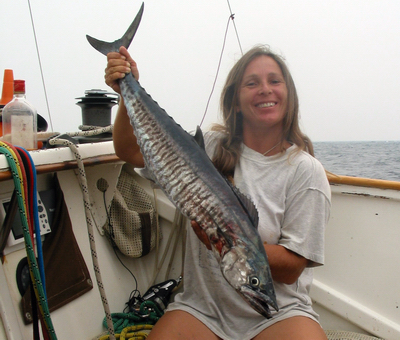 . .
We can also catch fish without having to visit fishermen for them! A perfect catch, Chrissi! And great eating! if we dallied for too long. So we took a long jump northward with a planned stop in the small island of Surutu. This took us right past Borneo and the Indonesian state of Kalimantan. That's where we hit the SMOKE. At about 2 degrees 30 minutes South latitude. The smoke is from the intentional burning of the tropical rainforest - to facilitate the growing of Palm Oil. we were finally up to the far northern part of Malaysia. Dreadful stuff. And it stinks - bad. another island north of Surutu, but still pretty close to Kalimantan. Visibility was frequently about 100 to 200 meters. Having no radar, that made it pretty hairy when sailing across busy traffic lanes in these waters. In the anchorages, we found that insects that normally "sing" at night were confused and sang in the day. We had a lot of lost birds catching a ride with us. The smoke and its smell had them totally lost and confused. 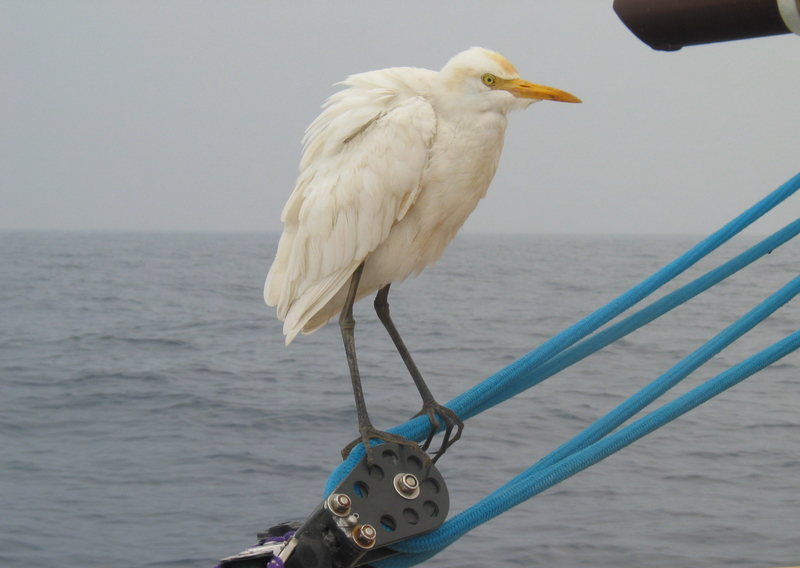 This egret stayed with us a couple of days, never ate, and was finally so weak, that it couldn't fly and fell overboard as we finally approached land. 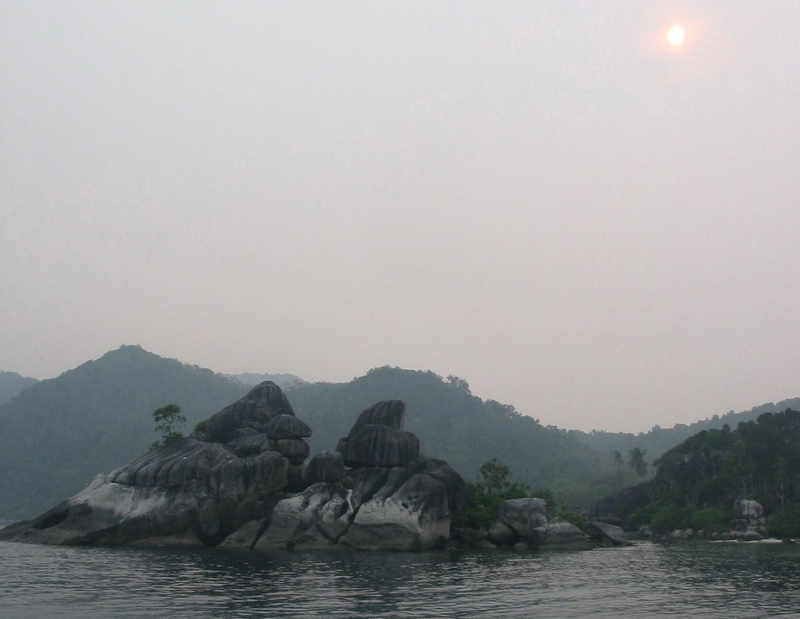 Human society in these parts is devastated by the Palm Oil industry too: with isolated ruined poor villages that rarely emerge from the pall of stinking smoke. 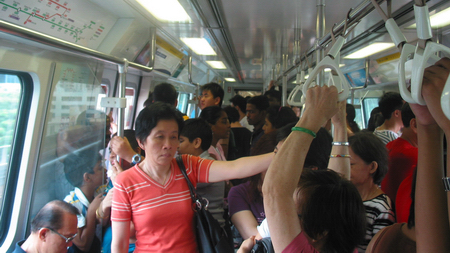 Singapore was complaining about the smoke to the Indonesia authorities when we got there. But it didn't seem to do any good. for Singapore. It had been a fantastic trip in Indo, and we were off for new and very different adventures.